Atlus has published new information on Dragon’s Crown, the PlayStation 3 & Vita game that will also have a new PlayStation 4 version titled Dragon’s Crown Pro on February 8 in Japan. 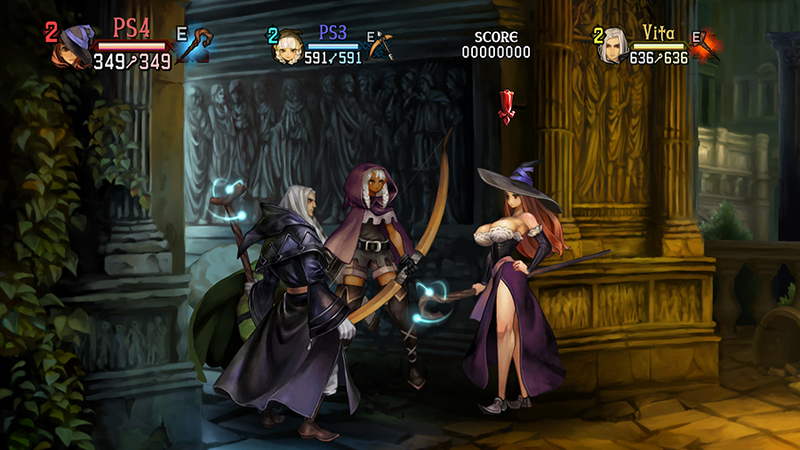 It turns out that they will release an update patch to version 1.07 that will make the original owners of Dragon’s Crown be able to have cross-platform saves and multiplayer with Dragon’s Crown Pro players on the PS4. Cross-platform saves and multiplayer between PS4, PS4, and PS Vita versions will be supported. You will be able to give names to inventory bags. In the equipment selection screen, you will be able to filter equipment by their effects. Opening the pause menu in-game will let you check the status of talisman acquisition and travel rewards of the current floor. You can now modify how the font looks like (stretching, rotation, etc) when editing a character’s name. When resetting skills in the Adventurers’ Guild, you can now include Extra Pocket to be reset. If you get the exact same skill right after you reset skills, the corresponding skill item will be automatically set into the inventory bag. You can now sell multiple items at once when selling at the Magic Item Shop. Added the Damage Effect setting in Options menu, where you can choose between Show for All, Show only for Player Character, or Do Not Show. Choosing the lesser settings will help ease up processing. Added another setting for the location of Rune Selection UI at HUD in Options menu. The choices are: Follow the Player, Bottom of the Cockpit, or Bottom of the Screen. You can now rotate fonts in Font Edit to 180 degrees, both to the left and right. Some percentages of items in the Shop are being readjusted. Some of the enemies’ special effects in the Ultimate difficulty are being readjusted. Improved the Tutorial feature for some characters. The priority location for cursor click is being readjusted. Camera work is being improved. Finally, Atlus has also advised that due to the new feature to name inventory bags, they had to reduce the maximum storable amount of Bones in the Temple from 32 to 28. So if there are Dragon’s Crown players who have 29 or more Bones, they are advised to use the Bones before the excess number gets wastefully discarded by the update patch.